Kelly Briggs, academic advisor in the College of Education's Center for Student Success, has been chosen for the highly competitive Emerging Leader Program, or ELP, hosted by NACADA: The Global Community for Academic Advising. Charlie Nutt, NACADA executive director, informed Briggs that she was one of 10 applicants worldwide selected for the two-year program that includes a stipend to attend the association's conferences. "The selection committee felt your application was excellent and that your involvement in this program will not only benefit you but also the association through your involvement with it," Nutt wrote. Briggs grew up and earned her bachelor's degree in Ontario, Canada, "without the benefit of an academic advisor." She worked as a K-12 teacher and guidance counselor in China and Egypt before marrying a U.S. soldier, and the couple moved to Manhattan when he received orders for Fort Riley. "I had never heard of academic advising until I moved to Kansas in 2012," Briggs said. 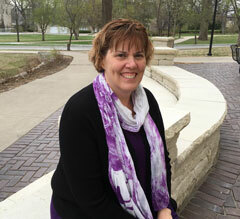 "That's where I discovered the master's in academic advising at K-State and realized advising was what I had always wanted to do but that didn't know existed." Briggs is passionate about serving military-connected students and serves as a committee member for K-State's annual event Meet Your Military-Connected Students that showcases specific programs and services for this population. In addition, she is a member of the NACADA military-connected advising community. Her passion led to co-authoring an article with three faculty members, "Creating and Sustaining a College-Wide Military-Connected Community of Practice," that was published in the Journal of Continuing Higher Education in October 2017. She also co-authored "The Winding Road: How Today's Student Consumes Higher Education" with fellow academic advisors Sandra Avalos and Mechelle Martinez published in Academic Advising in 2016.